A critique of the Declaration of Independence. 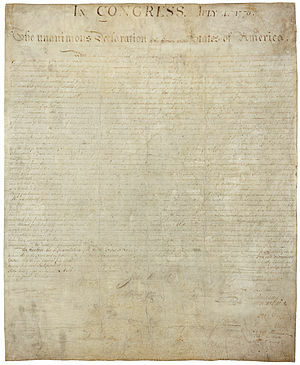 The Declaration of Independence here refers to the document drafted and signed in 1776 declaring the separation of 13 colonies along the Atlantic coast of North America from the British Empire. It is indeed one of the greatest writings ever made in human history…..but that hardly means it is flawless. Indeed, in this age it may be considered obsolete and merit some serious criticism. I will post text from it in red and my critiques of it in green. Considering that the colonists involved were mostly of the same European-Caucasian stock as the people still in Britain, this is odd. If this had been written by black people of Africa striving to break free from British rule, this would have made better sense. But in fact, the blacks in the colonies were mostly slaves and their freedom was not an issue here. No, those ideas are NOT self-evident. What about that slavery issue? And if by “Creator” they meant the Biblical God, that is certainly not valid. That God was by nature an absolute monarch and ruled his subjects like kings and emperors did, even condemning to hell those who rejected his rule. What rights do people have in such a system? NONE! This makes perfect sense. It should be that way everywhere. Maybe that explains most of the absolute monarchies and dictatorships that have existed for many decades in many parts of the world. But is it not better to say that NO evils should be considered sufferable, in order for the people to constantly seek and establish the best possible governments? The recent revolts overthrowing the dictators of Tunisia and Egypt were all about this. Ironically, the USA supported the regime of Hosni Mubarak until this year because it did not attempt to destroy the State of Israel, despite Mubarak being abusive to his own people. Can you spell H-Y-P-O-C-R-I-S-Y? — Such has been the patient sufferance of these Colonies; and such is now the necessity which constrains them to alter their former Systems of Government. The history of the present King of Great Britain is a history of repeated injuries and usurpations, all having in direct object the establishment of an absolute Tyranny over these States. To prove this, let Facts be submitted to a candid world. I cannot comment on most of the supposed violations of the king referred to here, but I will make note of this one: Libertarians ofter refer to this and claim that many of governmental offices established in the USA are no better than what the British monarch did. Including the IRS, the FBI, and the Department of Homeland Security. Today, the USA has by far the largest military budget in the world. In fact, it is six times larger than that of any other nation! This refers to the Boston Massacre. Ironically, the British soldiers who committed it were defended at their trial by John Adams, who would later become the second President of the United States. Hardly a “mock trial”, the proceedings were an attempt to give the soldiers a fair one. Thus, this statement was totally unjustified. The purpose of the colonies was to increase the wealth of the United Kingdom. Imposing taxes was part of this. You might as well have asked for there to be no colonies. This refers to Canada, which remained in the British Empire, partly because so many Loyalists from the colonies fled to it as the American Revolution took place. Even more ironically, part of Canada was Quebec, a French colony which had been conquered by the British in the French and Indian War decades earlier. But the British were able to hold onto Quebec anyway. Maybe if the French and Indian War had not been fought, the British would not have lost the other American colonies. Even the strongest national empire can only do so much. Many of these mercenaries came from the German kingdoms and provinces. But the colonies soon got their own mercenaries from France and other countries. This was known as impressment and was similar to the draft or conscription that was done to increase the membership of armies in most countries, then and now. After the Revolution, the United States never did this, and after the Vietnam War the draft for the land based American Armed Forces was abolished as well. Drafting and impressment are forms of slavery. This is a statement of blatant racism. Native American tribes, like all other human groups, have a variety of behaviors. Plus, they were fighting in most cases to keep the land they had been living on that the whites were stealing from them. And consider what the U S Army did to Native Americans in the Wounded Knee Massacre, which until recently was called the “Battle” of Wounded Knee. Here are some examples of Earth’s core irony: In addition to killing off Native Americans and imprisoning the survivors in concentration camps called “reservations”, we Americans conquered Hawaii and disposed of its own native government for American business interests and then fought a war to keep control of the Phillippines after taking those islands from Spain. I cannot imagine a Native American, a native Hawaiian, or a Philippine reading the Declaration of Independence and regarding it with anything other than scorn. And I swear, if I ever hear another conservative American politician claim that we owe our freedom to the American troops, I will scream! It’s simply one of the biggest lies ever told. It wasn’t generals who wrote the Declaration of Independence or the U S Constitution of 1787, it was LAWYERS. And you don’t hire a soldier to fight for your rights in a court, do you? Maybe those British subjects were as blind to their wrongdoings as Americans today are often blind to many of their nation’s wrongdoings over the past 200 years. This entry was posted in History, hypocrisy, justice, racism, Social studies and tagged United States Declaration of Independence. Bookmark the permalink. ← Even worse than Conservapedia!